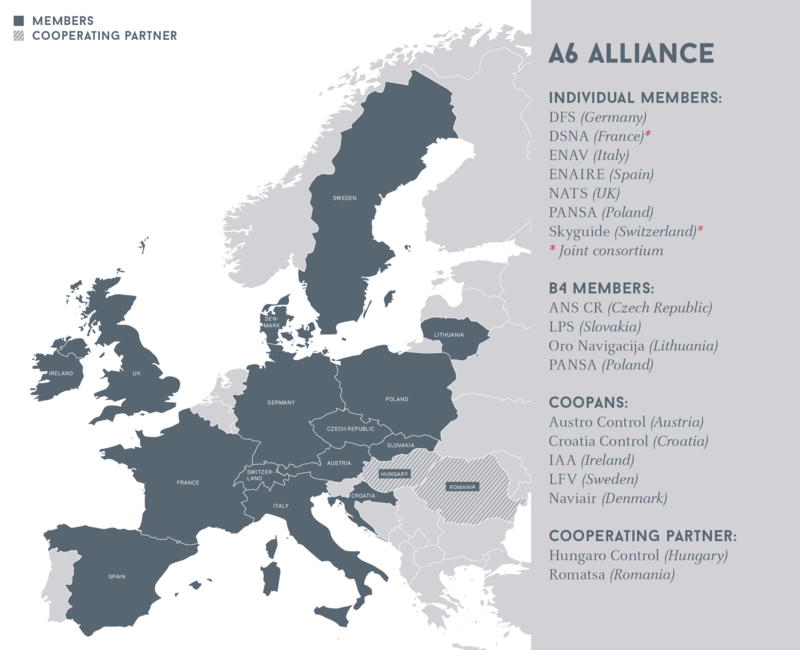 The A6 alliance was founded in 2011 by the six ANSP members of the SESAR JU – DFS (Germany), DSNA (France), ENAIRE (Spain), ENAV (Italy), NATS (UK) and NORACON – a consortium including Austro Control (Austria), AVINOR (Norway), EANS (Estonia), Finavia (Finland), IAA (Ireland), LFV (Sweden) and Naviair (Denmark). In 2015 PANSA (Poland) became a full member of the A6 Alliance, together with the COOPANS Alliance for work associated with Deployment Manager and SESAR 2020; and the B4 Consortium for work associated with SESAR 2020. The A6 Alliance has also reached a collaboration agreement with Skyguide in relation to SESAR 2020 R&D activities. Seven of Europe’s nine Functional Airspace Blocks (FABs) – the geographic pillar of SES – are now represented within the A6 Alliance and our members are responsible for the safe management of more than 80% of Europe’s air traffic, and more than 70% of the investment in the future European ATM infrastructure. While the FABs are primarily focused on operational performance improvement, the A6 Alliance is focused on SESAR development and deployment, SESAR deployment execution (planning, governance, funding), and key strategic areas of A6 common interest related to transport and aviation legislation. We seek to maximise synergies between the ANSP members of the A6 Alliance to deliver customer and network benefits; and to provide leadership at a European level in critical technical and strategic areas. The A6 is an inclusive initiative for ANSP contribution to modernising the European ATM system and welcomes interest and input from non-A6 members. * B4 Consortium: Representing the ANSPs of the Czech Republic (ANS CR), Lithuania (Oro Navigacija), Poland (PANSA) and Slovak Republic (LPS), the B4 Consortium is a member of the A6 Alliance on work associated with SESAR 2020 R&D. * COOPANS Alliance: Representing the ANSPs of Austria (Austro Control), Croatia (Croatia Control), Denmark (Naviair), Ireland (IAA) and Sweden (LFV), the COOPANS Alliance is a member of the A6 Alliance on work associated with the Deployment Manager and SESAR 2020.